There would be "more moderate" groups that would identify the grand unification as the first wrong turn, or supersymmetric field theories as the first wrong turn, or bosonic string theory, or superstring theory, or non-perturbative string theory, or M-theory, or the flux vacua, or something else. No, SO(10) is not really simpler and prettier, and such thinking was indeed a wrong turn in 1973 that lead theoretical physicists into a 40-year dead-end. You justify the group SU(3)×SU(2)×U(1) because all those group parameters were grounded in experimental observations. SU(3) is the 3-color-quark theory of strong interactions, SU(2) is the weak (beta decay), and U(1) is electromagnetism. SO(10) adds many new particles and phenomena that have never been observed and have no experimental basis. Supposed SO(10) unifies the forces, but it doesn't. It doesn't reduce the number of coupling constants or experimentally-determined parameters. It doesn't make the theory or analysis any easier. I have a theory that this wrong turn, and also a bunch of other subsequent ones, were rooted in some misconcepted about big physics successes of the past, notably relativity and quantum mechanics. Those theories were grounded in experiment, but there is a widespread belief that Einstein should get all the credit for relativity because he ignored the experiments and carried out the supposedly essential step of elevating principles to postulates. I wrote a book on How Einstein Ruined Physics, explaining the damage from this warped view of Einstein. So physicists came to believe that all the glory in physics goes to those who do such sterile theorizing. Hence grand unified theories that do not actually unify or explain anything. Einstein developed some of the most ground breaking theories in physics. So why have you written a book that examines him as a philosopher? Einstein’s theoretical accomplishments, especially the two theories of relativity, as well as his occasional philosophical pronouncements, had a tremendous impact in shaping the modern discipline of philosophy of science in the first half of the 20th century. Also, throughout his career as a theoretical physicist, Einstein in fact adhered to a particular style of philosophizing, though not in a sense familiar to academic departments of philosophy. I call this a “philosophy of principles”; his central innovations came by elevating certain physical, formal and even metaphysical principles to the status of postulates, and then exploring the empirical consequences. This is typical of Einstein idolizers crediting him for relativity being such a crucial and revolutionary breakthru. Lorentz's analysis started with Maxwell's equations, Michelson-Morley, and a couple of other experiments. From these, he deduced that the speed of light was constant, that the same physics holds in different frames, and the Lorentz transformations. FitzGerald, Larmor, Poincare, and Minkowski used similar reasoning. What set Einstein apart, in the eyes of Ryckman and other philosophers, was that he elevated the constant speed of light and frame-independence principles (from Lorentz and Poincare) to the status of postulates, instead of empirical science. As historian Arthur I. Miller argues, Lorentz and Poincare were willing to admit that experiments might prove the theory wrong, and so Einstein should get all the credit. This is a backwards view of what science is all about. As Lorentz pointed out, Einstein just postulated what had previously been proved. Just to be clear, I don't want to criticize new mathematical works. Poincare and Minkowski injected new mathematical ideas and interpretations into relativity, and that was great work. Einstein did not find any new mathematics or physics. He is idolized because he took what was called "principles" in the physics literature, and elevated them to "postulates". That's all. To a mathematician or an empirical scientist, elevating a principle to a postulate is no accomplishment at all. Einstein was famous for his pacifist views yet set them aside to contribute towards the development of the atomic bomb. This was something he later regretted, campaigning for nuclear disarmament alongside Bertrand Russell. What spurred his, albeit temporary, interest in the development of atomic weapons? The short answer is that Einstein hated the Germans, and wanted to nuke them. He only regretted the bomb because he was a Communist and opposed the Cold War. What do you see as his most important contribution to the philosophy of science? In my opinion, Einstein demonstrates that it is possible to be a “realist” about science without adopting the metaphysical presuppositions of what is today called “scientific realism”. In particular, Einstein balanced the aspirational or motivational realist attitude of many working scientists with the clear recognition that realism remains a metaphysical hypothesis, not demonstrable by empirical evidence. I thought that I was a realist myself, until I read the nonsense that philosophers write on the subject. Einstein's realism is an incoherent mess, and the philosophers are worse. 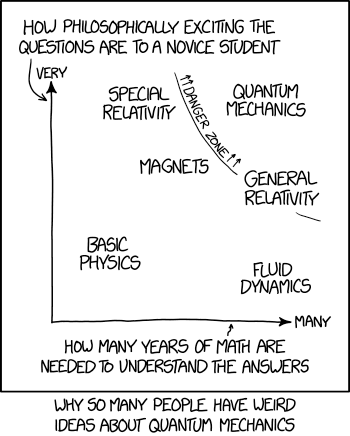 From xkcd comic. These comics are sometimes obscure, so there is an explanation page. I cannot even tell if this is a joke or not. Apparently academic geography has been lost to leftism. Tycho Brahe was a brilliant astronomer who probably did more to advance accurate observations than anyone. 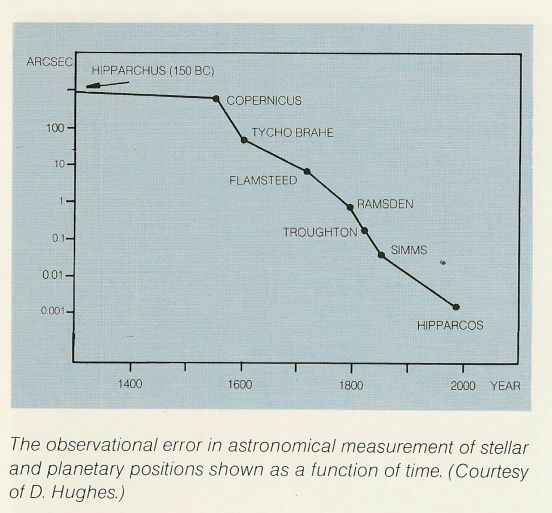 I got the chart from the recent paper, Astrometric accuracy during the past 2000 years. It has other similar charts. It shows a lot of later advances in accuracy, but those are mainly technological advances. At Tycho's time, there had been very little advance in astronomy over the previous millennium. 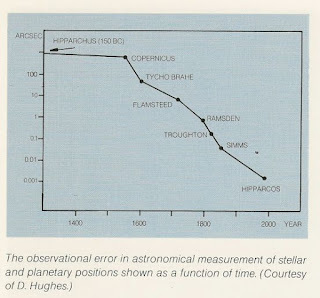 The telescope still had not been invented, but Tycho collected better data than everyone before him put together. Without Tycho's work, Kepler never could have done what he did, and without Kepler, Newton could not have done what he did. Without Newton, we might still be farmers. Elliot McGucken alerts me to LIGO controversies. Peter Woit debunks claims that LIGO confirms the extra dimensions of string theory. I have previously complained that LIGO uses fake data injections, with only 3 ppl knowing whether a black hole collision has been faked. Wave Observatory (LIGO) announced that they had successfully detected gravitational waves, subtle ripples in the fabric of space-time that had been stirred up by the collision of two black holes. The team held a press conference in Washington to announce the landmark findings. They also released their data. This is funny. Did LIGO release its data or not? If LIGO released its raw data, then others have access to it. A lot of researchers do not release their raw data, and thus avoid the detailed scrutiny of others. Their attitude is often that competing researchers should go do their own experiments, and collect their own data. The ensure the results are accurate, LIGO uses two observatories, 3,000 kilometers apart, which operate synchronously, each double-checking the other's observations. The noise at each detector should be completely uncorrelated, meaning a noise like a stormnearby one detector doesn't show up as noise in the other. However, if a gravitational wave is found, it should create a similar signal in both instruments nearly simultaneously. The main claim of Jackson's team is that there appears to be correlated noise in the detectors at the time of the gravitational-wave signal. The main idea behind LIGO is to have two detectors, 2000 miles apart, and look for correlations in the data. Each detector by itself just looks like noise. Any big correlation is assumed to be a black hole collision in a distant galaxy. Finding correlations should be child's play, but it takes the LIGO team many months to announce that they found a correlation. LIGO analyses use whitened data when searching for compact binary mergers such as GW150914. When repeating the analysis of Creswell et al. on whitened data these effects are completely absent. 3. Our 5-sigma significance comes from a procedure of repeatedly time-shifting the data, which is not invalidated if correlations of the type described in Creswell et al. are present. In other words, the LIGO team massages the data to get rid of the small correlations found by the critics. This is lame. It is appears that the LIGO team is whitewashing some data in order to make their black hole collision model appears more accurate. They do not want to admit that there are some unexplained correlations. LIGO Skeptic blog is also all over this. I have posted about important causality is to physics, and now I see an article claiming a quantum counterexample. The trick they use involves creating a special type of quantum 'superposition'. ... The two observable states can be used as the binary states (1 and 0) of quantum bits, or qubits, which are the basic elements of quantum computers. The researchers extend this concept by creating a causal superposition. In this case, the two states represent sequences of events: a particle goes first through gate A and then through gate B (so that A's output state determines B's input), or vice versa. This research is somewhat interesting, but it is not what it appears. They find an ambiguity in the path of the photon, but there are always such ambiguities in quantum mechanics. In a simple double-slit experiment, where a light source sends photons thru a slit A and slit B to a screen, the detector on the screen cannot tell you whether the photo went thru slit A or B. The preferred interpretation is that the light is some sort of quantum wave that goes thru both slits. The light is not really photons until they hit the detectors. This experiment does not really violate causality as the term is usually understood. It is just another of many experiments that are hard to interpret if you think of light as Newtonian particles. Such experiments convinced physicists that light is a wave about 200 years ago. A century ago light was found to be a funny quantized wave, but not a particle in the way you normally think of particles. I don't agree with calling light a particle, but I also don't agree with saying that it is random up until the instant of a measurement. We don't really know how to make sense out of such statements. Quantum mechanics is a theory about making predictions about observations, and I think Bohr and Heisenberg would say that it doesn't make any sense to talk about the path of the photon (such as going thru slit A or B, or going from A to B or B to A) unless you are actually measuring it.